Gradually Accepting Naturalism's False Premises reviewed how many Catholics had gotten so accustomed to cultural trends contrary to God's Holy Laws and thus to the good of their own immortal souls that they become, at least for the most part, incapable of seeing the world clearly through the eyes of the true Faith and of expressing even the slightest bit of outrage when the latest offense to God is given by the scions of popular culture and/or those in the real of public policy and electoral politics, no less react at all when outrages are given to God by the scions of the counterfeit church of conciliarism. This forgetfulness that we are creatures, which prevails in that energetically bad portion of the world which is scriptually called the world, affects multitudes of persons, who are either less able to divest themselves of the influences of old traditions and early lessons, or are happily less possessed with the base spirit of the world. It leads them to form a sort of religion for themselves which singularly falls in with all the most corrupt propensities of our hearts: a religion which in effect teaches that we can live two lives and serve two masters. Such persons consider that religion has its own sphere, and worldly interests their sphere also, and that the one must not interfere with the other. Thus their tendency is to concentrate all the religion of the week into Sunday, and to conceive that they have thereby purchased a right to a large conscience for the rest of the week. The world, they say, has its claims and God has His claims. Both must be satisfied; God first, and most scrupulously; then the world, not less exactly, though it be indeed secondary. But it is not a "reasonable service" to neglect one for the other. God and the world are coordinate powers, coordinate fountains of moral duty and obligation. He is really the religious man who gives neither of them reason to complain. We must let our common sense hinder us from becoming over-righteous. Men who hold this doctrine, a doctrine admirably adapted for a commercial country, have a great advantage over the bolder men of whom we spoke before. For they enjoy all the practical laxity of unbelievers, without the trouble or responsibility of disbelieving; and besides that, they enjoy a certain good humor of conscience in consequence of the outward respect they pay, in due season and fitting place, to the ceremonies of religion. Protestantism has given impetus to a new wave of radical individualism, anticlericalism and semi-Pelagianism in the past 491 years that has made possible the triumph of naturalism in the midst of the world and thus in the hearts and minds of so many hundreds of millions of Catholics yet attached to the structures of the counterfeit church of conciliarism. It has been a relatively easy thing for Catholics who have made these accommodations to the spirit of Protestantism to have acted likewise as the counterfeit church of conciliarism has adopted and implemented much of the Protestant and Judeo-Masonic spirit, starting with the abominable Novus Ordo service. There is no need to do battle with the "world" when its false spirit has been enshrined in what purports to be the Catholic liturgy and is defended in the "official" documents issued by and under the authority of the conciliar "pontiffs." Thus it is that many of the social evils that came to the surface of popular culture in the 1960s have been "mainstreamed" into daily life. Our immortal souls are bombarded in supermarkets and other retail stores with the horrors of "rock" "music." We must put up with this assault upon our senses as shopping is a necessity, although we should not subject our children to this assault if it possible to do so. We must not subject ourselves to the devil's "music" voluntarily. There are, for example, restaurants that do not play "rock" "music" and it is these that should be patronized. It is indeed quite evil to voluntarily subject ourselves or our children to "rock" "music" by seeking to eat in restaurants, no matter how "good" their food fare might be, where such evil assaults the senses when there are other choices available. "Rock" "music," however, is one of those evils that has been "mainstreamed" in the past fifty years. What was one an eclectic preserve of teenagers and college students that aroused the condemnation of at least a few solid Catholic bishops and priests is now an "accepted norm," especially as the "baby boomers" of the 1950s and 1960s have become older and serve now as the decision-makers of the corporations that make the marketing decisions as to what "music" to play in various retail outlets. As is the case with any other evil, such as Protestantism, that becomes "accepted" over time simply because most people, including most Catholics have come to believe that past judgments were too "harsh" and that we must seek to find the "good" in something that has become so widespread and institutionalize, "rock music" has become "accepted" precisely because most people are used to it after decades of being exposed to it day in and day out without cease. As noted last week in Taking Advice From The Fuller Brush Man, it is incongruous for anyone to claim that the Episcopalian practitioner of perversion, Gene Robinson, represents anything other than the result of the logical progress of degeneration started by the Protestant Revolt. The Fuller Brush Man, Billy Graham, and Gene Robinson are but two sides of the same coin minted by Martin Luther and John Calvin in the Sixteenth Century. The horrors represented by Gene Robinson do not make the evils propagated by Billy Graham any the less serious. It is, therefore, quite a telling sign that L'Osservatore Romano, the semi-official newspaper of the Vatican, has published an article praising the "musical" group that was the progenitor of many social evils, including the glorification of the use of marijuana as a "recreational drug" that dulls the senses and blurs one's rational abilities (more on this subject soon), the Beatles, as being "more creative than the 'standardized and stereotyped' pop of today." In other words, the Beatles and their work can be viewed favorably because of their "staying power" and because they "inspired" others to follow their example. Well, I will be the first to admit that the "work" of the Beatles was "inspired," only noting, as I did to my mother when I was watching a report on these mopheads on the Huntley-Brinkley Report in February of 1964, that the source of the "inspiration" was the devil himself. VATICAN CITY (CNS) -- The Vatican newspaper said the musical compositions of the Beatles were far more creative than the "standardized and stereotyped" pop music of today. The Beatles' songs have demonstrated "remarkable staying power, becoming a source of inspiration for more than one generation of pop musicians," it said. As for John Lennon's famous quip in 1966 that the Beatles were more famous than Jesus Christ, the Vatican newspaper dismissed it as youthful bragging. The alleged musical "creativity" of the Beatles was nothing other than a continuation of the musical revolution begun by Ludwig von Beethoven, who said that he wrote music to please himself and for no one else, including God and His Holy Church. The Beatles used this "creativity" to propagandize in behalf of a social revolution against Our Blessed Lord and Saviour Jesus Christ and His Sacred Teaching, helping to convince millions upon millions of young people to "indulge" themselves and to believe in a sense of world "peace" absent a subordination of men and their nations to the true Church that Our Lord founded upon the Rock of Peter, the Pope. (For an excellent discussion of "rock" "music" in the general and the Beatles in particular, please see Michael Matt's Gods of Wasteland) And to dismiss John Lennon's blasphemy against Our Blessed Lord and Saviour Jesus Christ as nothing other than "youthful bragging" is beneath contempt. Then again, it is easy to dismiss the blasphemy of a "pop culture" when one has been accustomed to "rock music" in "papal" "Masses" and when one makes a living justifying abominations as a putative "pope" esteeming the symbols of false religions with his own priestly hands. How is it going to be possible for a parent attached to the structures of the counterfeit church of conciliarism to convince his children not to listen to any kind of "rock" "music," including that of the Beatles, when the semi-official newspaper of the Vatican, now in conciliar captivity, endorses this rot from Hell? And how is it possible for any true priest who makes no concessions at all to conciliarism to be silent about this evil and not to warn his parishioners that it is a Mortal Sin to listen volitionally to "rock music" of any type? Silence about this evil serves the interests of the devil, not the honor and glory of God and the eternal good of souls, and pastors of souls would be well-advised to consider what Saint John Mary Vianney and Padre Pio would do in our circumstances today, namely, to insist that Catholics not only not listen to "rock music" but to destroy any and all records, tapes, compact discs or videos in their possession containing this diabolical "art" form. This is not Jansenism. This is Catholicism. The counterfeit church of conciliarism has used "rock music" in its liturgies, including at "Papal" "Masses," especially those for World Youth Day. L'Osservatore Romano's praise of the Beatles just demonstrates yet again that the errors of Modernity have found quite a home in the nooks and crannies of the Modernists who run the counterfeit church of conciliarism. L'Osservatore Romano's warm embrace of the Beatles, however, coincides with Karol Wojtyla/John Paul II's an Joseph Ratzinger/Benedict XVI's embrace of much of Modernity, including the religiously indifferentist civil state, something that will be examine yet again the next article to be published on this site. Suffice it to say for present purposes, however, to note that the more one accommodates himself to yesterday's evils (Protestantism, religious indifferentism, the existence of religiously indifferentist public "school," "religious liberty," divorce, contraception, abortion, the promotion of perversity under cover of law and abroad in the midst of popular culture, "rock music," indecency of speech and immodesty of dress) ) will be the more that one accepts these evils as accepted "norms," about which it is "impossible" to do anything than to give a shrug of the shoulder and/or to revel in as part of our "rights" as American citizens. Although we can certainly use this day of national thanksgiving to a generic, Judeo-Masonic concept of "God" to Catholicize it as we call to mind the old Saint Martin's Day feasts of thanksgiving in Catholic Europe and the first thanksgiving day offered on the territory of the future United States of America by Spanish Catholics near Saint Augustine, Florida in 1565, we must remember that the "blessings" of "liberty" that many will "celebrate" today include the very evils of "yesterday" that have become today's accepted "norms." There will be millions upon millions of Americans today who will gather around their dinner tables with family members to give thanks to "God" for the election of Barack Hussein Obama to the Presidency of the United States of America, some of those same mullions will be thanking "God" for keeping surgical abortion "safe and legal" in this country as they listen to the beat of "rock music" at the same time. Other delusional millions will be giving "thanks" to the outgoing President, George Walker Bush, for having given Iraq a "democracy" and for having done "so much" to help restore a "culture of life." We must remember that the entirety of the Americas belongs to Our Lady, who appeared to Juan Diego on Tepeyac Hill on December 9 and 12, 1531, to seek their conversion to the true Faith and hence to the Social Reign of her Divine Son, Our Blessed Lord and Saviour Jesus Christ. Long before those wretched, Catholic-hating Calvinists, whose co-religionists had sought to invade Catholic Lima, Peru, a short time before their own arrival in Plymouth Bay, the vast expanse of the Americas had been Catholicized. The Holy Sacrifice of the Mass, which the "Pilgrims" hated with a passion, had been offered on these shores. The very names of places reflected the influence of the Holy Faith. The Americas belong to Our Lady, not to Protestants, not to naturalists (whether liberal, libertarian, conservative, socialist, communist, utilitarian, et al. ), not to pagans and not to adherents of the Talmud. Consider the fact that the first Mass on the mainland of the Americas had been offered in Honduras in 1502. The first Mass in New Mexico was offered in Mission San Gabriel in 1598. The first Mass offered by French missionaries in New France was in 1615 by Father Denis Jamay, O.F.M., and it was in Quebec that the first Mass in honor of the Most Sacred Heart of Jesus was offered and where the cult of the Holy Family, begun under the pioneering Bishop Francois de Montmorency Laval. The first Mass in Texas was on October 12, 1680, 188 years after Christopher Columbus had landed on the Island of San Salvador in the Bahamas Islands. The North American Martyrs, each of whom was so tenderly devoted to the Mother of God, offered their lives between 1642 and 1649 to Catholicize their part of the Americas. We have an obligation to plant the seeds for the conversion of the Americas once again to the true Faith and that our own country will become the Catholic States of America. Here We must include that harmful and never sufficiently denounced freedom to publish any writings whatever and disseminate them to the people, which some dare to demand and promote with so great a clamor. We are horrified to see what monstrous doctrines and prodigious errors are disseminated far and wide in countless books, pamphlets, and other writings which, though small in weight, are very great in malice. We are in tears at the abuse which proceeds from them over the face of the earth. Some are so carried away that they contentiously assert that the flock of errors arising from them is sufficiently compensated by the publication of some book which defends religion and truth. Every law condemns deliberately doing evil simply because there is some hope that good may result. Is there any sane man who would say poison ought to be distributed, sold publicly, stored, and even drunk because some antidote is available and those who use it may be snatched from death again and again. Every day is "thanksgiving day" for a Catholic. A true Thanksgiving is offered to God the Father through His Divine Son, Our Blessed Lord and Saviour Jesus Christ, in Spirit and in Truth every time a true bishop or a true priest offers the Holy Sacrifice of the Mass. The very word "Eucharist" means Thanksgiving, which is one of the four ends of the Mass (Adoration, Reparation, Petition are the other three). We are to give thanks to the Most Blessed Trinity at all times with every beat of our hearts, consecrated as they must be to the Most Sacred Heart of Jesus through the Sorrowful and Immaculate Heart of Mary. And it came to pass, as he was going to Jerusalem, he passed through the midst of Samaria and Galilee. And as he entered into a certain town, there met him ten men that were lepers, who stood afar off; And lifted up their voice, saying: Jesus, master, have mercy on us. Whom when he saw, he said: Go, show yourselves to the priests. And it came to pass, as they went, they were made clean. And one of them, when he saw that he was made clean, went back, with a loud voice glorifying God. How many times have we been made clean in the Sacred Tribunal of Penance? Why are we so slow to seek out true offerings of Holy Mass on a daily basis and to spend time with Our Beloved in His Real Presence in the Most Blessed Sacrament? We are to give thanks for being given the gift of the Catholic Faith and for being liberated from the falsehoods of the counterfeit church of conciliarism (and from all concessions to the false shepherds of that false church who have made their own accommodations to the false spirit of the world, the flesh and the devil). We are to give thanks for being given true priests and true priests in this time of apostasy and betrayal so that we can have true offerings of Holy Mass and the valid administration of the Sacrament of Penance, whereby souls steeped in Mortal Sin can be regenerated by the merits of the Most Precious Blood of Our Divine Redeemer. We are to give thanks each day as Catholics for our parents, whether living or deceased, and our spouses, whether living or deceased, and our children and grandchildren and friends. We are also to give thanks to God for all of those who have been part of our lives in the past but from whom we are now estranged for various reasons, including the ecclesiastical crisis caused by the apostates in the counterfeit church of conciliarism. We must forgive all past grievances and offenses, whether real or imagined, as we pray to be forgiven for our own sins that others may still hold yet against us, praying fervently for a happy reconciliation at the General Resurrection of the Dead on the Last Day. We are even to give thanks for being alive in this era of apostasy and betrayal as it has been God's Holy Will from all eternity that we be born and live at this time, meaning that there is work for us to do in cooperation with the graces won for by the shedding of every single drop of Our Blessed Lord and Saviour Jesus Christ's Most Precious Blood and that flow into our hearts and souls through the loving hands of Our Lady, she who is the Mediatrix of All Graces. Early one morning shortly after her mother's death, a family servant came silently upon the little one standing on her tiptoes, stretching upwards, impelled by love, until she reached the statue of the Blessed Virgin. As she leaned her head against the Madonna, the servant heard the child say: From now on, You will be my Mother! By this time Catherine's elder sister, Marie Louise, had left to join the Sisters of Charity, and the little girl who had always been obedient now had to direct and supervise the homestead. She looked after everything: she made the bread, cooked and did the housework, carried daily meals to the workmen in the fields and cared well for the animals. Once, when she was in the village church, she saw a vision of an old priest saying Mass. After Mass the priest turned and beckoned to her with his finger, but she drew backwards, keeping her eyes on him. The vision moved to a sickroom where she saw the same priest, who said: "My child, it is a good deed to look after the sick; you run away from me now, but one day you will be glad to come to me. God had designs for you. Do not forget it!" At that time, of course, she did not understand the significance of the vision. The most remarkable miracle was the conversion of Alphonse Ratisbonne, a wealthy Jewish banker and lawyer and also a blasphemer and hater of Catholicism, in 1841. A Catholic friend, M. de Bussieres, gave him a medal, daring him to wear it and say a Memorare. After considerable persuasion he agreed to do so. Not long after, Alphonse accompanied M. de Bussieres to the Church of Sant ' Andrea delle Frate to make funeral arrangements for a dear friend. 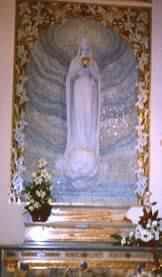 There Alphonse saw a vision of Mary as on the Miraculous Medal. He was converted instantly and immediately begged for Baptism. The words "O Mary, conceived without sin, pray for us who have recourse to thee" represent, of course, a foreshadowing of the solemn and infallible proclamation by Pope Pius IX of Our Lady's Immaculate Conception just twenty-four years later. Our Lady's apparitions to Saint Catherine Laboure began the modern Age of Mary as Our Lady was to appear once again, on September 8, 1840, in the Convent on Rue du Bac to Sister Justine Bisqueyburo, and then in La Salette, France, in 1846, Lourdes, France, in 1858 (ratifying the solemn proclamation of her Immaculate Conception), and then Pontmain and Pellevoisin, France, Knock, Ireland, Fatima, Portugal, and Banneaux and Beauraing, Belgium. Many people were saved from a plague when they were given the then named Medal of the Immaculate Conception to wear. 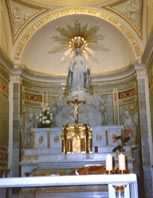 And, as noted in the account provided by Our Lady of the Rosary Library, the Miraculous Medal converted the Catholic-hating Jew named Alphonse Ratisbonne, who has the singular privilege of Our Lady appearing to him in the Church of San Andrea della Fratte in Rome, Italy, on January 20, 1842 (so much for false ecumenism!). One of the greatest gifts that we can give to our children and our friends is a truly blessed Miraculous Medal. We must give thanks to Our Blessed Lord and Saviour Jesus Christ for giving us this great sacramental through the loving hands of His Most Blessed Mother--and for letting her give us the Green Scapular to help convert those who had strayed from the Faith or who had never been Catholic at any point in their lives. This is indeed the Age of Mary, and to be alive in this time in which Our Lady has appeared to us to beg us, her children, to pray her Most Holy Rosary and to do penance for sinners by pledging ourselves to her Immaculate Heart is a great grace for which we must give thanks constantly. Yes, my friends, every day is a true "thanksgiving day" for a Catholic. We need to pray that all men in this country and around the world will yoke themselves to her Immaculate Heart by means of Total Consecration according to the forum la of Saint Louis de Montfort. There will be no talk of "rock music" or indecency or immodesty thereafter as we would never want to grieve Our Blessed Mother's Immaculate Heart again by means of our sins and by means of being indifferent to the protection of sin in the civil law and its promotion and spread in the popular culture.